Wilson, Colin. Ritual in the Dark. N.Y.: Popular Library, 1961. Number SP-85. 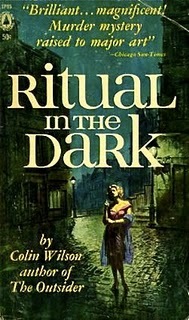 For Wilson’s Jack-the-Ripper-esque thriller set in mid-twentieth century London, the uncredited cover art for the Popular Library reprint presents a solitary blonde amid an inner city backdrop that's both gloomily sinister and brightly lit at the same time.